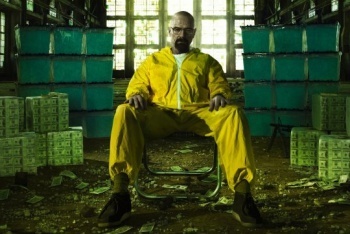 Breaking Bad's Walter White is so impressively evil that George R.R. Martin has been inspired to step up his game. This does not bode well for Westeros. A Song of Ice and Fire (along with its TV adaptation Game of Thrones) has some pretty evil characters. Arguably, most of its characters fall somewhere on the scale between evil and downright monstrous. And yet, series author George R.R. Martin has been one-upped. After watching the most recent episode of Breaking Bad, he admitted that he'd been beaten at his own game, remarking that "Walter White is a bigger monster than anyone in Westeros." Now, anyone can make that comparison and take part in the ensuing argument that will inevitably follow. But remember, this comes from the man who is still actively writing the future of Westeros, and that means he still has time to reclaim his throne. Fans who were shocked by Martin's first comment should be terrified of what he said next: "I need to do something about that." You think Joffrey's bad? Or the Red Wedding? It might be time to buckle down; it's only getting more evil from here. Despite the grudge, Martin harbors no ill will towards Breaking Bad. He calls it an "amazing series," and is eager to see how it fares against Game of Thrones at this year's Emmys. Breaking Bad is wrapping up its final season, but Game of Thrones has a lot of material left to cover - Season 4 is scheduled to premiere early next year, and Martin still has two novels to finish before the saga is over. If he's serious about one-upping Walter White, I just hope there's a world left to fight over by then.